Is your workplace policy on cannabis use up to date? This policy template offers employers an easy to use, customizable and legally-reviewed document with which to properly address potential cannabis-related issues in the workplace. Is Your Organization Ready for Legalized Cannabis? With both recreational and medicinal uses, cannabis represents a unique challenge for employers. Traditional drug and alcohol policies may cover some aspects of workplace health and safety, however having specific documentation in place related to cannabis ensures your company and employees have a clear set of guidelines in place. Click below to get your copy of the template. The cannabis policy template has been designed for easy customization. Simply fill in your company information as indicated and you're good to go. You can also add personalized branding, such as your corporate logo, to the document. This template is suited for organizations big and small. With one flat rate you are able to implement a cohesive cannabis policy organization-wide. With the Cannabis in the Workplace policy template, you can rest assured that it looks professional and conforms to HR best practices with regards to OSH and workplace drug policies. What format is the template in? 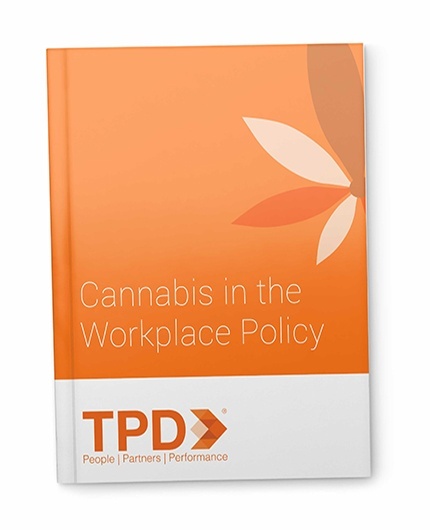 The cannabis in the workplace policy template is in MS-Word format which enables you to make customizations that best suit your company’s needs. How will I receive the template? The template will be available for download automatically once your payment has been processed. What information does the template contain? The cannabis template contains important definitions and provides reference to employees working in a safety sensitive position, accommodating individuals using cannabis in the workplace, best practices for consumption of medicinal cannabis at work, recreational cannabis and cannabis edibles as well as complaints and associated procedures. What jurisdictions does this template apply to? This template was designed to be used across Canada. This document is written for employers, managers and individuals who are responsible for human resources or health and safety in the workplace. More questions? Feel free to contact us directly if you have any questions about the Cannabis in the Workplace Policy Template. © 2018 TPD | All Rights Reserved.